WyoCloud is a university-wide initiative to provide modern and sophisticated solutions for today’s demands and challenges on our University by implementing the Oracle Fusion Cloud systems of Enterprise Resource Planning, Human Capital Management, Grants Management, Budgeting & Planning, Supply Chain Management, and Reporting & Analytics. Oracle Fusion Cloud systems was selected because of its proven ability to meet the university’s needs and its depth of experience in higher education. The implementation will occur in eight phases over the next 36 months. The first phase is implementing the Oracle Fusion Cloud Enterprise Resource Planning (ERP) to replace the university’s finance system, which is targeted to go live July 2017. 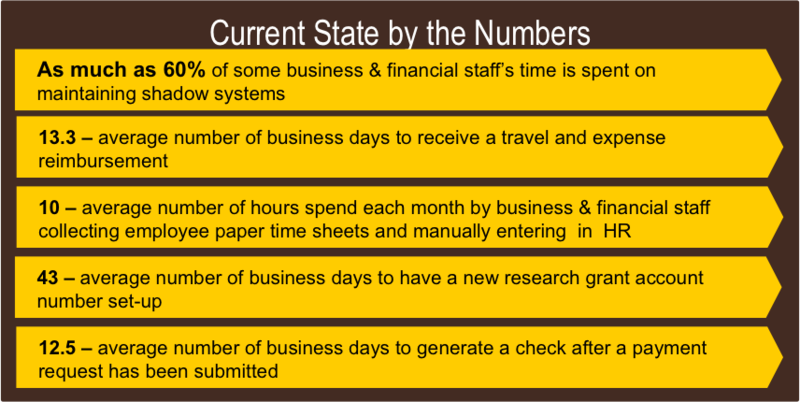 The University of Wyoming’s current system was implemented nearly 20 years ago. In recent years, a variety of stakeholders, including trustees, administrators, legislators, alumni, faculty, staff, and students have all recognized the need for an updated and improved finance and reporting system. Oracle Fusion Cloud fulfills this need. This implementation will transform the way the University does business at every level, providing a modern and synchronized platform that will allow university faculty and staff members to spend less time on paperwork and more time on efforts that contribute to the University’s mission.